NOW a novel technique speedily kills pathogens in water. The water filter created by scientists from Stanford university, uses electrically treated cotton fabric to deactivate bacteria instead of just filtering the water. 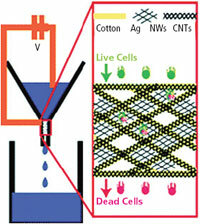 The fabric combines carbon nanotubes and silver nanowires, which are good conductors of electricity. The team tested the efficacy of the filter at five different voltages between -20 V and +20 V. The treated fabric was placed in a funnel and water containing E coli was passed through it at the rate of one litre per hour. The filter performed its best at -20 V, killing 89 per cent of the bacteria. Researchers said repeating the process thrice can filter more than 98 per cent of the bacteria. The fabric provides a high surface area to deactivate bacteria and does not get clogged in the process. The next step is to determine the filter’s efficacy on other microorganisms, researchers said in a study published in the September issue of Nano Letters. The ultimate impact of the technology, lies in its implementation as a low-costpoint- of-use water filter, they said. Running the purifier in areas where electricity is a problem might be difficult. “The economics and efficiency of this method should be established and compared with conventional disinfection techniques like chlorination, widely used in our country,” said Pawan Labhasetwar, scientist with the National Environment Engineering Research Institute in Pune, who heads an Indian standards committee seeking to set domestic standards for water purification. Operation and maintenance of these units especially in rural areas will be a challenge, Labhasetwar added. Where grid-electricity is a problem,the unit can be powered by Solar-cells.